At 4pm January 9, Shenzhen Enterprises Innovative Products New Conference and 2018 General Assembly of FSZI were held in Wu Zhou Guest House. 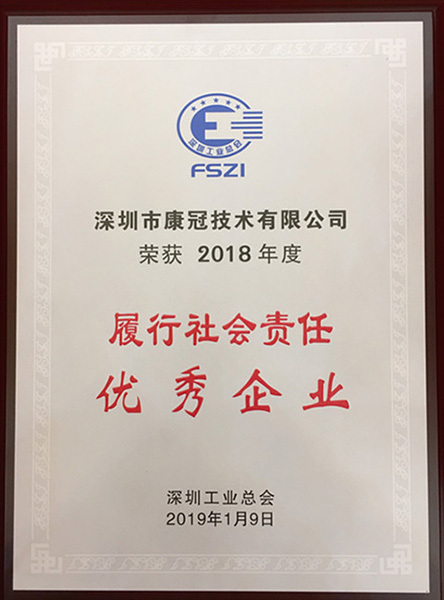 “Outstanding enterprises of fulfilling social responsibilities” and “excellent enterprises of fulfilling social responsibilities” were commended. KTC won the honorary title of “excellent enterprise of fulfilling social responsibilities”. Over the years, KTC has been consciously incorporating its social responsibilities into corporate strategies, culture, production and management while seeking for self-development. It is willing to be subject to the supervision of the government and the public, fulfill social responsibilities and pursue both social and economic benefits. It has made contributions in green development, environmental protection, promoting employment and participating in social public welfare and set a good corporate image. This award means a high affirmation for the corporate image and quality of KTC Group. In the future, KTC will remain true to its original aspiration to strengthen scientific innovation, improve core competitiveness, assume social responsibilities and contribute more to the development of the area and the social civilization and harmony. Previous: 2018 Work Summary and Award Ceremony of KTC Group were successfully concluded Next: KTC was awarded the title of "Shenzhen Private Enterprise with Outstanding Contributions on the 40th Anniversary of Reform and Opening up"